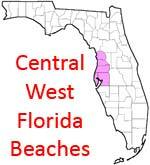 You can expect to find many beautiful state parks and public beaches on the Central West Coast of Florida. White sand, crystal clear blue water and beaming sunshine. Apollo Beach is named for the mythical Greek God who brought light and warmth to the world each day. Locals say that the name was given by Dorothy Corr, the wife of the community´s developer and founder Francis J. Corr, in the 1960s when the US space program was taking off in Florida. Belleair Beach maintains a relaxed and peaceful atmosphere providing all the advantages of waterfront living and the charm of an old-fashioned neighborhood. Beach lovers can enjoy swimming, sunbathing and beachcombing. Clearwater Beach is home of pristine white sand beaches, clear gulf waters, warm sunshine, and plenty of hospitality. There is always something special going on at Clearwater Beach. Howard Park's location provides access to the Gulf of Mexico by a 1-mile long causeway. The white sandy beach is a very popular north county swim area and also provides a perfect location for visitors to enjoy many spectacular sunsets. Nesting ospreys and eagles may be viewed by park visitors as they fish for food in the surrounding waters. The pioneers called it Hog Island, but it became Honeymoon Isle in 1939 when a New York developer built 50 palm - thatched bungalows for honeymooners. Today, visitors can drive across Dunedin Causeway to enjoy the sun - drenched Gulf beaches, mangrove swamps, and tidal flats. The beach in Hudson is small and usually frequented by locals, but recently more vacation goers have discovered that it is a nice place to be. Everyday people come here to relax, take in the sun, go out on their boats, and watch the waves, without parking problems and overcrowding. This beach has the interesting distinction of being built BY the people who lived here in the 1960's. Indian Rocks Beach is located on a barrier island on the West Coast of Florida, only a 30 minute drive from Tampa International Airport. Indian Rocks Beach attracts many tourist due to it's wide sandy beaches and convenient proximity to many Florida Attractions including Busch Gardens, Walt Disney World, Universal Studio, and Sea World, as well as the cities of Clearwater, St. Petersburg, and Tampa. Madeira Beach is located on Florida's beautiful Gulf Coast and is blessed with miles of gorgeous white sand beaches that boast that "Old Florida" feel yet Madeira Beach is part of the Tampa Bay region, one of the nations fastest growing metro areas. Mad Beach offers you and your family a quiet "laid back" atmosphere while being just a short drive from Florida's major theme parks. Relax. Get barefoot! Pass-A-Grille brings out the adventurer in you. Beachcombing, boating, visiting quaint shops and then later, relax in one of our unique Inns. No matter where you go and what you do the water calls you from just blocks away. The Town of Redington Beach, Florida, is located on a barrier island in the Gulf of Mexico. We are bordered by North Redington Beach to the north, Madeira Beach to the south, the Intracoastal Waterway on the east, and the Gulf of Mexico on the west. Redington Beach is primarily a waterfront residential community. Redington Beach is a state chartered municipality, located in Pinellas County, west of Tampa, Tampa Bay and St. Petersburg. Home of pristine white sand beaches, clear gulf waters, warm sunshine, and plenty of hospitality. St. Petersburg attracts visitors with the famous Salvador Dali Museum, award winning Fort De Soto Park and the St. Petersburg Pier. You want Florida, you want it all, and you only want to unpack once. No problem! You want Tampa. There’s a sunny side to this West Coast community that makes this a true hot spot among the world’s destinations. What you will find at the Tarpon Springs Sponge Docks: Greek Restaurants, Bakeries, Natural Sponges, Sponge Diving, Tours, Sightseeing Cruises, Unique Greek and Florida Souvenirs, lots of Shopping, Jewelry, Art galleries, Aquarium, and Live Entertainment (Bouzoukia).